Ferrari Crusaders,Unlucky Or Just Couldn't Floor It! 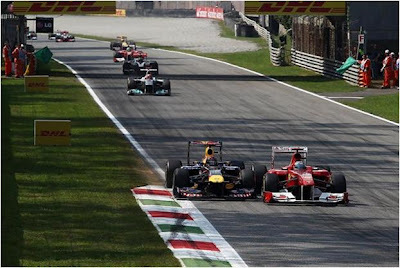 Autodromo di Monza, a lot of Italian spectators keeping ginormous expectations from Ferrari just like the previous year with tons of pressure on the two drivers Fernando Alonso and Felipe Massa didn't prove to be a catalyst after all. As Fernando Alonso powered up his Ferrari at the start of the race and flew across Lewis Hamilton, Jenson Button of McLaren Mercedes and Sebastian Vettel Of RBR Renault, the Ferrari fans roared thunders of joy but the vibrance of lead didn't last that long as Sebastian Vettel, Jenson Button and Fernando Alonso fought with splinters of seconds. Fernando Alonso though fighting with subsistance mantained a constant p erformance giving a clear message to his fans that he was indeed somwhere on top of the food chain but however couldn't floor it when RBR Renault (Sebastian Vettel) blistered ahead at 200 mph. Not to mention Felipe Massa who was pretty optimistic and confident as well because his car was giving optimum performance and quick responses to his throttle ,luck just wasn't on his side when Mark Webber crashed the nose of his car in to the left end of the Ferrari causing it to spin 270 degrees giving minimum damage to the Ferrari but Massa had to face a tremendous loss as he struggled to reach from eight to sixth position in the entire fifty three lap session. Had it not happen, Massa would definitely have won a place for himself at the podium. Sebastian Vettel gaining pole postion had not surprised the Italian spectators and all the F1 viewers one bit. His RBR Renault slashed across the chequered flag causing an emotional break down;Vettel crying with tears of joy as not only he had won his first race at Autodromo di Monza during his debut but he has also broken 150 years of Italian unity. Scene Beyond Monza: British Grammy Award winner (1998) Jamiroquai known for his unique genre of music, Jazz;funk, made his surprise guest appearance at the Italian Grand Prix and drove a Ferrari 458 Italia with the two Ferrari drivers at Monza off racing schedules.They exchanged many humorous conversations and had loads of thrills while power sliding the 458 Italia on the circuit. I wish i had a ferry , I love those cars.